Famous Palestinian teen activist Ahad Tamimi was released from Israeli prison on Wednesday. 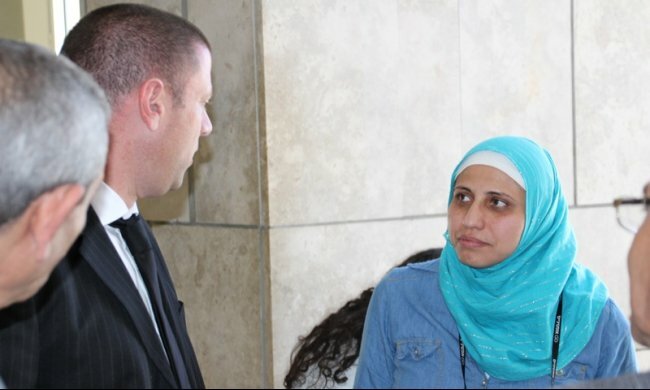 She was released after serving 8 months in jail for attacking an Israeli soldier or rather slapping an Israeli soldier as her little cousin was shot down by another Israeli soldier. Ahad was received by camera flashes and TV interview requests as she became a new iconic face of the Palestinians and their struggle. Needless to say, her mother Nermeen who was also imprisoned with her spoke about the elephant in the room we know and see about her daughter: She got international support, unlike another Palestinian teenager because of her blonde look. 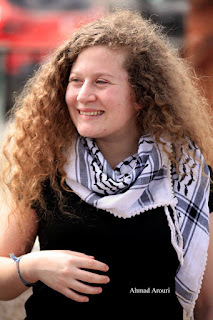 I am happy she is free "or partially free realistically speaking as she is on the radar of IDF" and I hope she continues staying away from that old Arab nationalism politics of her dad. 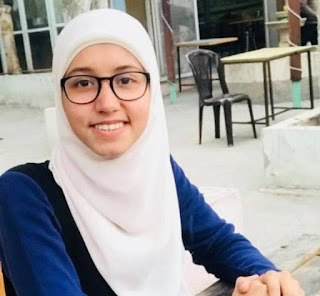 I hope she succeeds in studying international law so she can help in freeing other Palestinians detainees and also become a political figure in the future. Ahad is free now but there are more than 6500 Palestinian prisoners or POWs as Palestinians describe them in the Israeli prisons for political reasons. Among them, there are 350 children prisoners. There are too 800 prisoners who have a health condition and need true and better health treatment. There are also 700 Palestinian detainees who are still in prison with no charge or trial because of the Israeli administrative detention system. The girl who ate ice cream as soon as she got out of prison and returned back to her village; has not forgotten about them either. On the same day, the Tamimi girl with curly hair was released to her family; another Palestinian young was sentenced to jail for 7 months by an Israeli military court because of activism in University against the occupation. The girl is called Ola Marshood and she is a 21 years old student in the faculty of Mass communication, Nagah University. You can find her YouTube channel here. On Thursday, Palestinian Poet Dareen Tatour was sentenced 7 months because of she wrote a poem attacking the Israeli occupation and calling for resistance. Since October 2015, she has been detained sometimes in prison and sometimes under house arrest all that time because of a poem. Pen International has been calling for the release of Tatour for some time now but Israel does not give damn. Before Ola and Dareen are sentenced to jail and before Ahad Tamimi was released, on 24 July a Palestinian writer was taken a group of Israeli soldiers from her house because of what she had written against the Israeli occupation. 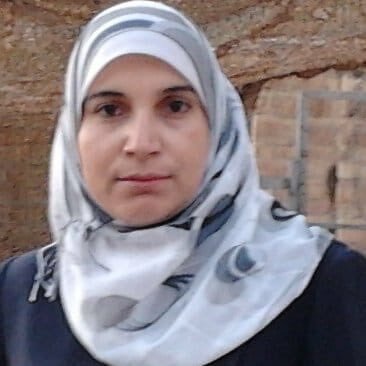 42-years old Lama Khater was arrested from her house on 24 July and currently, she is detained pending investigation because of she wrote online against the occupation. Lama Khater’s photos showing her hugging her 3-years-old son good bye at night as Israeli IDF thugs were standing behind her went viral. 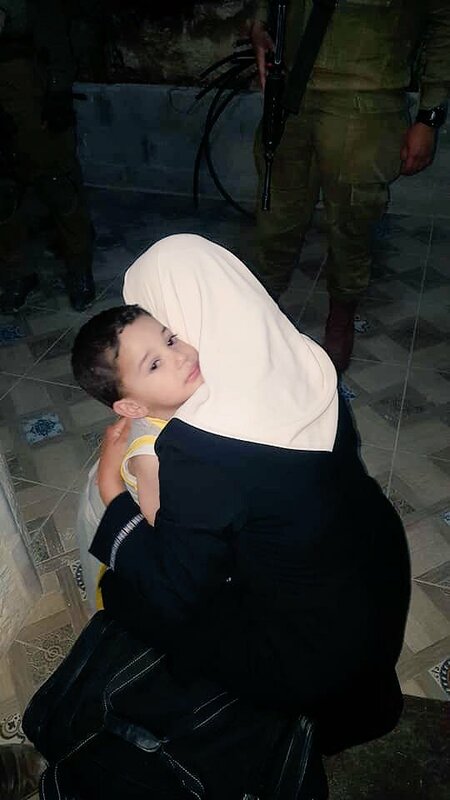 No mother should be separated from her child because she wrote something criticizing an occupation !! And just before anyone brings up my own country’s record in jailing poets and writers, I am totally against the imprisonment of writers and poets let alone military trials for civilians in front of military courts. Personally, I wish the Egyptian authors union would act and issue a statement demanding the release of Dareen and Lama but I doubt they would do that. They failed to do that with their fellow Egyptian writers and poets like Poet Galal El-Behairy who was sentenced on Tuesday to three years in prison for insulting the Egyptian army. Galal El-Behairy was found guilty of writing a poem insulting the Egyptian army in front of a military court. He was reported to the military prosecution by lawyer Tarek Mahmoud in March allegedly for insulting the Egyptian army and Prophet Mohamed “PBUH” in his alleged collection of poems under the name “The best women of the world”. “The best women of the world” is a direct mockery to the alleged Prophet Mohamed “PBUH” quote that “Egypt has the best soldiers of the world”. According to El-Behairy’s lawyers, he was found guilty of publishing a collection of poems that have not been published yet despite Raseef22 published its cover. From what I understand when Pro-regime media began to attack the young poet, his publishing house canceled his contract and did not release the collection of poems in early March. Some people say “The best women of world” collection of poems is available online as PDF but I have not seen it yet. Either way, Behairy became famous after it was found that he had written the lyrics of Ramy Essam’s anti-Sisi song “Balha” just before the presidential elections. International human rights organizations and organizations like Pen International have called the release of Behairy for the past months but in vain. Back to Palestine, I have one good last news to share with you as I read it earlier this week. According to the World Bank Gender group, 23% of Palestinian high-tech entrepreneurs are women despite all the hardships they face and it is one of the highest rates in the World. I do not think that this is shared in mainstream media as it should. You know this fact now and I think it is deserved to be shared. "She got international support, unlike another Palestinian teenager because of her blonde look." I am familiar with claims very much akin to that one. For example, the claim that when a girl goes missing, the media cares only if she's pretty and white. What about Ahad? I don't know how to say this without sounding a bit cruel. She's very homely. She doesn't have a prettiness factor working in her favor. If blondeness is a factor, she's not that blonde. Well, if you're comparing her to Arabs, she is, I guess. But we are talking here about the international press. Her hair needs to strike up an acquaintance with a brush. It's an unappealing rat's nest, which creates the unfortunate, unfair, and surely false impression that her personal hygiene is inadequate. That surely limits how much credit she gets for its blondeness. Rachel Corrie threw herself under a tank, and got huge press attention, but she was blonder and way prettier. So good looks certainly don't hurt. Conclusion - The international press is interested in Ahad Tamimi for legitimate reasons, not for her looks. Nonetheless, she could use a makeover. Once again, shallow talk Jason. Not becoming for a man. Certainly not, if one claims any intellectual superiority. Deb, I will try to do better. Hugs to you Jason :) I'm accused of being a blurter and often get in trouble myself for it. Personalities are what they are.